Plant pathogens cause huge yield losses. Plant defense often depends on toxic secondary metabolites that inhibit pathogen growth. Because most secondary metabolites are also toxic to the plant, specific transporters are needed to deliver them to the pathogens. To identify the transporters that function in plant defense, we screened Arabidopsis thaliana mutants of full-size ABCG transporters for hypersensitivity to sclareol, an antifungal compound. We found that atabcg34 mutants were hypersensitive to sclareol and to the necrotrophic fungi Alternaria brassicicola and Botrytis cinerea. AtABCG34 expression was induced by A. brassicicola inoculation as well as by methyl-jasmonate, a defense-related phytohormone, and AtABCG34 was polarly localized at the external face of the plasma membrane of epidermal cells of leaves and roots. 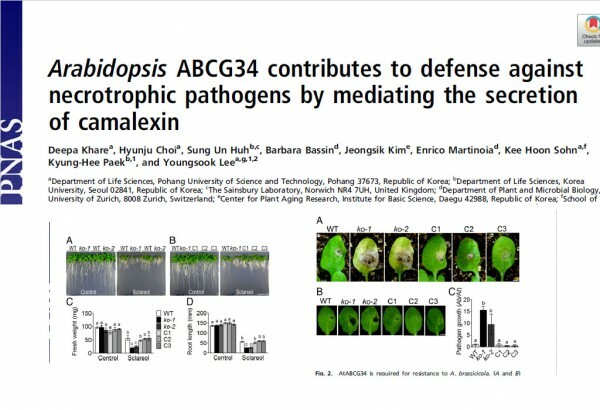 atabcg34 mutants secreted less camalexin, a major phytoalexin in A. thaliana, whereas plants overexpressing AtABCG34 secreted more camalexin to the leaf surface and were more resistant to the pathogen. When treated with exogenous camalexin, atabcg34 mutants exhibited hypersensitivity, whereas BY2 cells expressing AtABCG34 exhibited improved resistance. Analyses of natural Arabidopsis accessions revealed that AtABCG34 contributes to the disease resistance in naturally occurring genetic variants, albeit to a small extent. Together, our data suggest that AtABCG34 mediates camalexin secretion to the leaf surface and thereby prevents A. brassicicola infection.